The Coopered Tot: Spice Tree is a fierce but elegant excursion into the deep wood. Spice Tree is a fierce but elegant excursion into the deep wood. An homage to G-LO. Can you identify the hero? Spice Tree: 46% abv; $65 at Shopper's Vineyard. 50ml sample proved by Robin Robinson at the chocolate pairing tasting event preview. Color: light amber with some greenish tints. A nice rich color. Lovely light amber with greenish tints. Nose: malt, honey, demara sugar, a bit of meaty note - like Christmas ham (roasted salted pork with cloves and a sugar glaze), a touch of herbal vegetal sap (parsley, cress or burdock), some sherry, and a distant hint of fine leather (as in nice gloves, not cowboy saddle). Classy - very poised. Opening is sweet and bright with plenty of sugar and also a pronounced herbal note - like a cross between parsley and black mint. Then it is suddenly and dramatically spicy. The first hint is a complex oaky balsa wood perfume flavor that rapidly broadens into a spike of spice heat that is prickly and numbing on the tongue in the same manner as clove or cinnamon (without actually tasting a great deal like either). At the same time vanilla perfume and a rich sherry note provide a sweet and floral counterpoint. The transition to the finish is marked by a melding of the sweet and heat which combine to form a flavor reminiscent of ginger. Then the oak takes over and the lingering finish is a drying and elegant wood fest. This is the longest finish in the regular release Compass Box line and it's a pleasure. The heat doesn't build up on repeated sipping, like it would with actual clove, cinnamon, or ginger. Instead it forms a continuous backdrop to the complex array of flavors balancing sweet and dry, sugars, herbs, spice, and wood essences in a shifting interplay from nose to opening to midpalate bloom to finish to afterglow over and over. It's a highly engaging and thought provoking and richly flavored dram. The heat might be a bit much for some (my wife, for example, didn't like it at all - but she's not much for whisky generally). But those in for a bit of gustatory challenge will be rewarded by John Glaser's excursion in a totally new flavor direction. This amping up of the wood note is an inspired and entertaining new direction for Scotch - another face card in the loaded Full House hand that is Scotch's extraordinary variability. Not only is this the archetype of a new flavor profile - it's also a delicious and extremely drinkable success. Loved it! Nice review, Josh. I'm definitely going to try Spice Tree at some point. I love an oaky bourbon, so I figure this out to be enjoyable. BTW: Nice picture, but I'm afraid G-LO had you beat with his great lighting ;-) I don't know how to take great pictures like G-LO does; I just point the camera and click! Spice Tree is a winner. It's very very different. Hot and spicy yet sweet and clearly Scotch. Try a sample first to see if you can like it for the long haul if you're doing a bottle. It's my favorite of the regular (non-limited) Compass Box expressions. Love the pics and am extremely flattered by the homage. Gotta have fun with this stuff right? Let's face it, we're writing about drinking alcoholic beverages. While the creation of these spirits is serious, the enjoyment should be respectful but fun. I think we bloggers are achieving this! 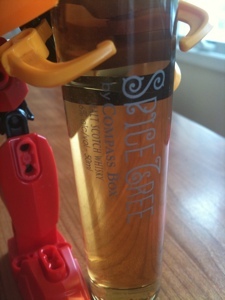 The Spice Tree is next on my list of Compass Box whiskeys to review. Just had The Peat Monster last week (and took some photos of course). My review will be up shortly. Spice Tree sounds delicious! I only had a brief sip once, and it definitely made me curious. Look forward to trying it! Once again, great tasting notes. Much more vivid than anything I've been able to pull together. Can't wait to compare notes on this one. Hi G-LO! I was inspired by your Oak Cross image. Thanks for the kind words. I actually knew you were doing Spice Tree next. I'm looking forward to your review. If you though Oak Cross was cinnamon altoids (and didn't like it) this one will be even more wicked on your palate. I recall in your Oak Cross review that I was strangely drawn to your cinnamon altoid comment and said "yeeowch - that sounds AWESOME". I'm very drawn to that kind of hot flavor profile. I'm prolific with the hot sauce too. 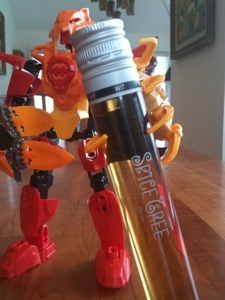 Spice Tree is hotter than Oak Cross - but it still manages to come off as elegant Scotch. It's quite the trick. Maybe you'll hate it because of that heat! I'll be quite curious to see what you think of it. Cracked open my bottle of Spice Tree for a whisky tasting event last night and was very impressed. Spicy and sweet. This was by far the best whisky of the evening. The bottle is almost gone (there were 12 people), so it is a good thing that I have a second bottle in reserve. I paired it with a ginger-pear upside-down cake (candied ginger, nutmeg, etc., in the cake as well), which provided a complimentary, rather than contrasting flavour. After my sample I bought a whole bottle. Spice Tree continues to deliver. The malts used in this blend are excellent and the barrel management adds big notes of vanilla & clove spice heat. It's a superb combination that really delivers malt whisky enjoyment at a very acceptable real-world price. To me, Spice Tree wins as an every day dram. Your pairing with the ginger-pear cake w/baking spices sounds inspired. It's right down home plate w/Spice Tree's own flavor signature. It would either harmonize beautifully or clash painfully. Sounds like the former. Thanks for posting the note. It harmonized beautifully (and I've finally gotten around to posting my own review). I took the rest of the bottle (there wasn't much left) with me when we went to visit my wife's parents over Canada Day, and shared it with other guests over dessert, this time paired with a hazelnut meringue, french vanilla ice cream, and fresh blueberries. It was just as good the second time around, but now I need to go looking for another bottle. I greatly appreciate you including the link to this page on your post, among other great reviews of this terrific vatted malt.